If you would like to experience the challenge and adventure of rockclimbing for the first time then come and join one of our introductory climbing sessions. 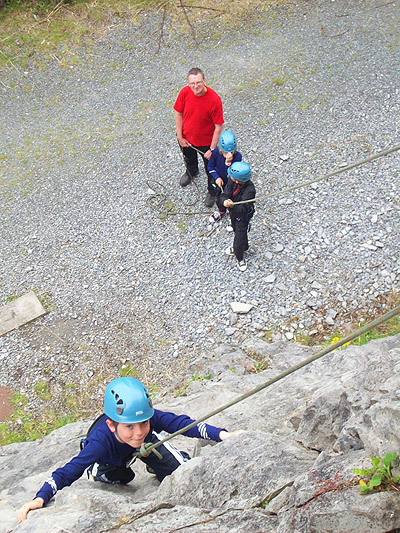 Designed primarily with challenge and enjoyment in mind, these courses are ideal for groups of 6-10 people. Venues include the Gap of Dunloe in Killarney, Ballykeefe Co. Kilkenny, Dalkey Quarry in Dublin, Glendalough Co Wicklow, Doolin Co Clare, and more. Abseiling, ziplines, and other roped adventures also available on demand. For introductory group sessions for 4-6 people rates start at €200. For larger groups, ziplines etc please get in touch to discuss details and pricing. If you have already experienced rockclimbing in a group or climbing wall situation perhaps you are interested in going a step further. These courses will see you get through a lot more climbing during your day. The focus is on covering as many varities of climbing styles as possible while also pushing your limits so that you can see just what you are capable of. Priced at €150 per day, this course is limited to 2 climbers per instructor/guide. Once you have gained some experience in rockclimbing the next step is moving on to 'Multipitch' climbs. This simply means that climbs are more than a ropelenght in height and climbing them requires the climbing team to lose touch with the ground completely. Your day is spent on cliffs 50-100m in height and you will see new techniques to compliment those you have already seen or learned on smaller climbs. 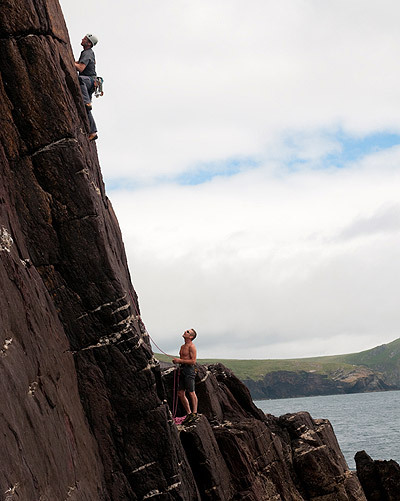 It is surely on these bigger cliffs that the full pleasure and excitement of rockclimbing is to be found. Venues include the Gap of Dunloe in Killarney, Glendalough Co Wicklow, Connemara Co Galway, and more. Priced at €175 per day this course is limited to 2 climbers per guide. Learning to lead and become an independent climber is probably the biggest step any climbers progression. Being the lead climber carries a lot of responsibility, both for your own safety but also for the safety and enjoyment of those who are climbing with you. Learning from experienced instructors is a great way to ensure you are getting the best advice and learning the most appropriate techniques. All our 'Learning to Lead' courses are custom designed to match the previous experience of the climbing students. Generally we would recommend a minimum of a two to four days training if you are completely new to leading. In this we will introduce you to the equipment and techniques involved and show you them in action. This is complimented by teaching you how to set up systems to allow you to practice in relative safety. Those who have already cut their teeth in lead-climbing can benefit hugely form 1or 2 days training, to fine tune good techniques and eliminate bad habits. If you want to be helped in taking this step in developing your climbing then get in touch and we can design a course to suit your experience and needs. Venues: The Burren Co Clare, Dalkey Quarry Dublin, Gap of Dunloe Killarney, Ballykeefe Co Kilkenny, and more Price on enquiry and agreement on course content. 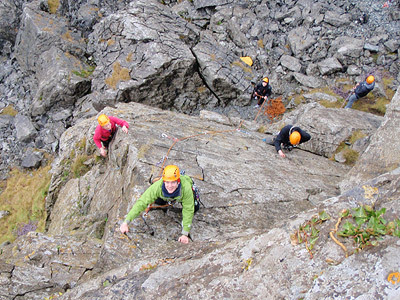 These 1 or 2 day courses are aimed at those who are already climbing independently at single pitch crags and would like to take the next step to multipitch climbs. The focus will be on the specific skills required for climbing and descending larger routes and cliffs. Venues: Gap of Dunloe Killarney, Glendalough Co Wicklow - the techniques can also be taught at single pitch venues such as Dalkey or The Burren but the bigger venues are recommended! Courses are €175 per day for 2 climbers. In some cases 3-4 climbers could be accommodated at €225 but prior discussion and agreement is essential. 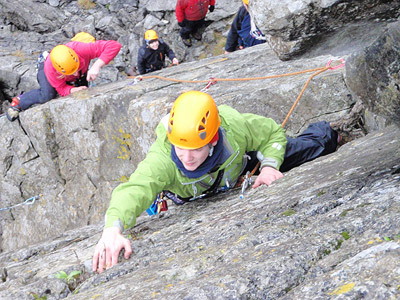 These 1 or 2 day courses are aimed at those who are already climbing independently and would like to learn the specific skills required for seacliff climbs such as abseiling into routes, ascending ropes in emergencies etc. 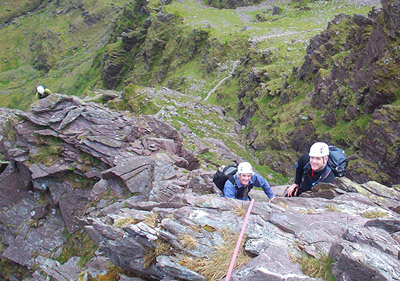 Venues: Gap of Dunloe Killarney (yes we know it's not a seacliff but it offers perfect opportunities for the skills required to be practiced and learned! ), The Burren Co Clare, Doonshean Head, Dingle. Hopefully you will have a long a trouble free climbing career but just in case everything doesn't go perfectly to plan, we have courses to teach you some basic ropework techniques which can help you get out of trouble. These include simple hoisting techniques for a stuck or tired climber, ascending ropes, escaping from the belay or rope system, unplanned or emergency descents... and more! These courses and techniques are based on using standard climbing equipment that your are likely to be carrying to effect safe and efficient escapes from difficult situations. Courses for 6-8 climbers from €200 per day. Venues - almost any established climbing venue or wall! This 2-day course focuses on unroped scrambling on Grade I Scrambles such as Cummenpeiste or Beenkeeragh Ridges, and introduces roped scrambling on Grade II and III terrain such as Hags Tooth or Howling Ridges. The primary aim is to give you the confidence and skills to tackle steeper and more exposed terrain in safety . This 2-day course covers the ropework and belaying techniques commonly used on Grade III* scrambles as distinct from rockclimbing techniques. The focus is on efficient and safe movement on steep exposed terrain using a minimum of equipment by utilising the natural rock features and ropehandling. Venue: McGillycuddy Reeks. 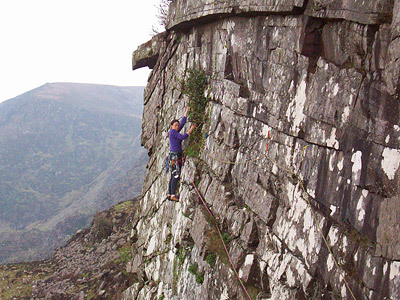 Price €350 for 2 day course for 2 climbers.